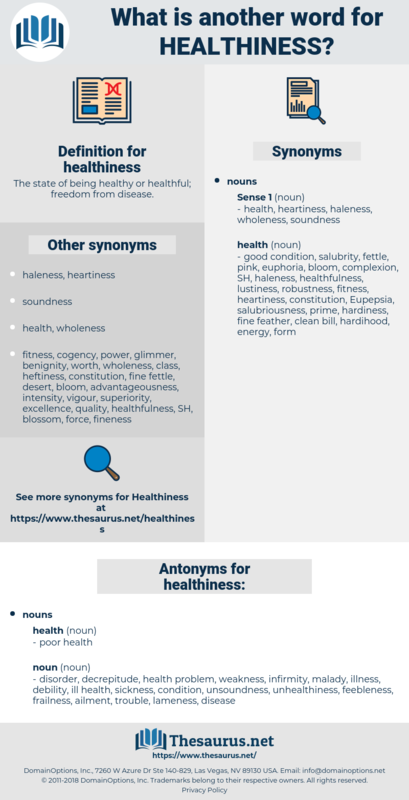 What is another word for healthiness? 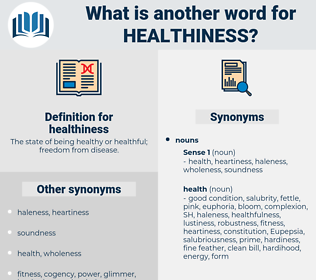 disorder, decrepitude, health problem, weakness, infirmity, malady, illness, debility, ill health, sickness, condition, unsoundness, unhealthiness, feebleness, frailness, ailment, trouble, lameness, disease. They are surrounded with garden space, and add not only to the beauty but to the healthiness of the city. Browning was interested in ethical problems; his robust and fortunate temperament allowed him to bridge over with a sort of buoyant healthiness the gaps of his philosophy.